Since autumn 2016, Sollingglas has been renewing individual windows of the Dresden Semper Opera House. Our thermally shaped and on old-fashioned looking panes carry the name “Antiqua”. The construction requirements for the tripartite windows is to give the outer panes the character of an old glazing by slightly deforming them and at the same time meet the current requirements for heat insulation. For this purpose, we have structured special glasses accordingly using a thermal process. The subsequent further processing into insulating glass takes place with the application of a heat protection layer on a second pane, which is connected to the first pane with a closed air volume as a spacer. Although the short-wave heat radiation of the sun enters the room through the vapour deposition with silver layers, the long-wave heat radiation is reflected back inwards from the interior due to the silver structure. 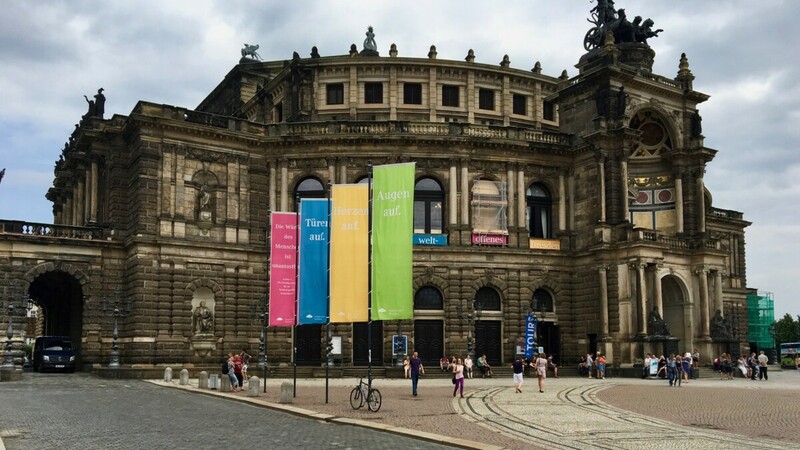 The Semperoper in Dresden is the opera house of the Saxon State Opera Dresden, which has a long historical tradition as the court and state opera of Saxony. It is located on Theaterplatz in the historic city centre of Dresden near the Elbe river and is named after its architect Gottfried Semper.